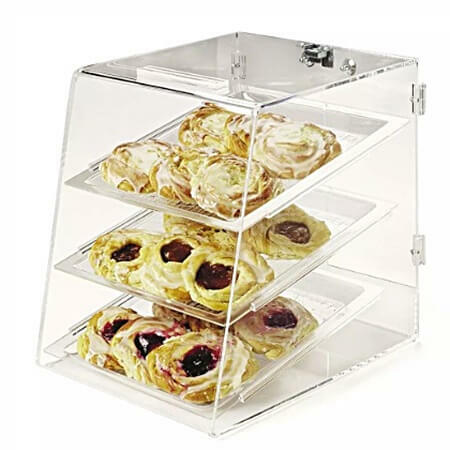 Give their taste buds a treat when you fill this Acrylic Pastry Display Case with your customer's favorites from pastries to cookies. 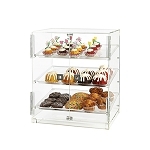 This clear display case lets you show all those yummy treats and keeps them within reach. 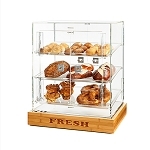 Whether you use for rolls or doughnuts this bakery case will add some style to your countertop. With three trays this bakery display lets you give your customers a variety to choose from. Line up several for a better selection and keep customers coming back for more. Pastry displays are a great addition to buffets and breakfast bars in hotels and restaurants. Place your order today at All Candy Containers.